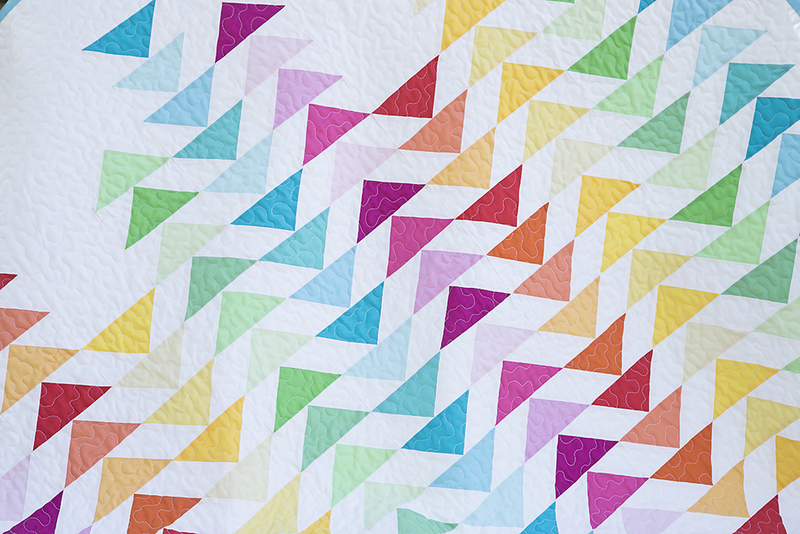 As promised, today I'm sharing my latest quilt finish, Spectrum. Several months ago, the folks at Robert Kaufman Fabrics asked me if I was interested in creating a pattern using their Kona solids. 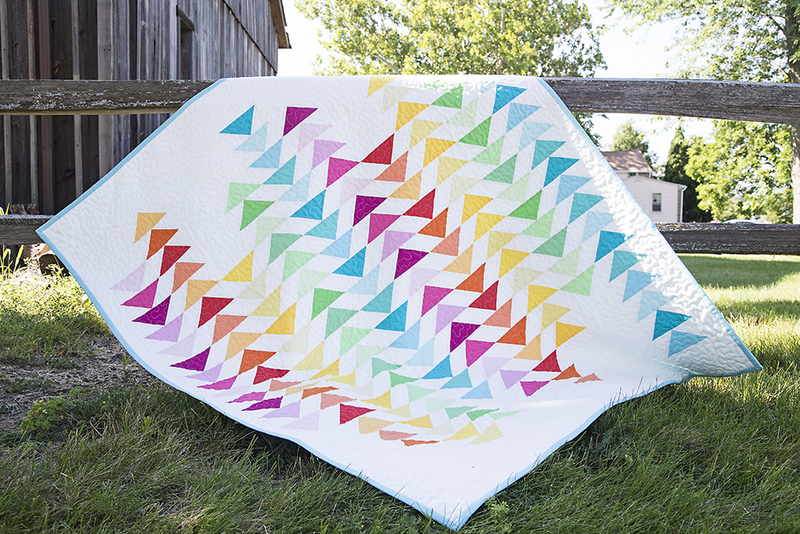 I have been sitting on this flying geese design for a bit, waiting for the right time to make the quilt. (Does anyone else do this?? I swear I have more quilt designs than I'll ever be able to make!) I decided the Kona's would be perfect for it. 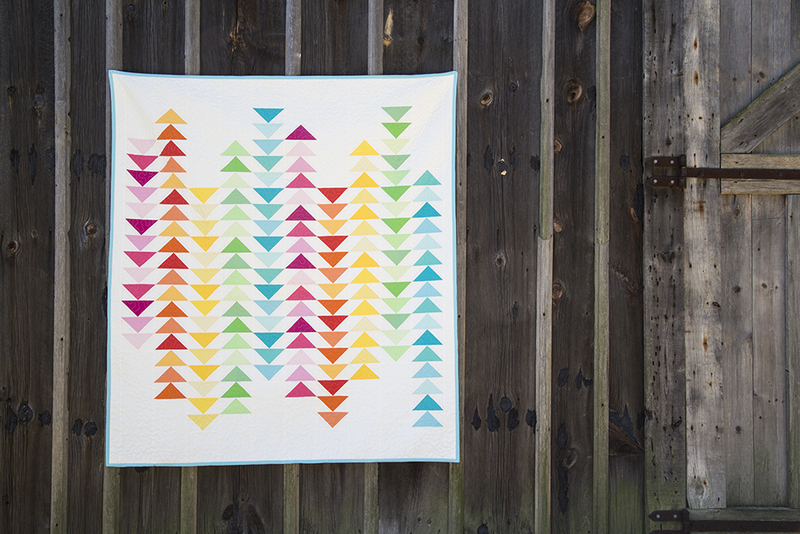 In this design, I took a classic quilting element (flying geese) and updated the design through use of negative space. By staggering the columns and leaving the tops and bottoms empty (piecing in the background fabric), a traditional concept now has a very modern feel. I quilted this using a free motion meandering design. I tried out the BSR (Bernina Stitch Regulator) on my Bernina 750QE for the first time. (I have used the BSR on my Bernina 440QE). It worked great! I put my pressure foot setting down to 0 and found that to be the easiest for smoothly moving the quilt around while stitching. The quilt measures 54" x 60". The pattern is now available as a PDF Digital Download in my pattern shop. Hardcopies are on their way as well and will be listed as soon as they arrive.